ITS Stamp News: Liat of "ITS Postal Auction No.60"
India – 1957/61 – Collection of stamps, unused with hinge remains – Forestry Congress (SG 353), Indian Mutiny (SG 386/7), Children’s Day (SG 389/91), Universities (SG 392/3), Silver Jubilee Indian Air Force (SG 397/8), 50th Anni. of First Airmail Flight (SG 436) – Rs.70. India – 1966-67 – Collection of commemorative stamps – SG 526/58 – 33v with white gum – Cat. £13 – Rs.450. India – 1968 – Collection of commemorative stamps – SG 559/81 – 22v without SG 572 with white gum – Cat. £14 – Rs.450. India – 1969 – Collection of commemorative stamps – SG 582/605 – 23v without SG 593 with white gum – Cat. £14 – Rs.475. India – 1969 – SG 582, 583, 586 to 592, 594, 599 to 601, 604 & 605 – 15 FDCs all with stamps of 20 paisa – Rs.100. India – 1970 – Collection of commemorative stamps – SG 606/30 – 24v without SG 619 with white gum – Cat. £10 – Rs.375. India – 1971 – Collection of commemorative stamps – SG 631/54 – 18v with white gum – Cat. £10 –Rs.375. India – 1972 – Collection of stamps – SG 656/71 – 10v without SG 664/67 & 670/71 with white gum – Rs.300. India – 1973 – Collection of commemorative stamps – SG 673/706 – 26v without SG 676, 678, 691, 696, 698, MS704 with white gum – Cat. £24 – Rs.475. India – 1973 – SG 681/84 – Indian Miniature Paintings – Cat. £2.50 – Rs.50. India – 1973 – SG 686 – 25th Year of Air India Services – Vertical pair with right/bottom margin – Cat. £8 – Rs.40. India – 1974 – Collection of commemorative stamps – SG 707/54 – 18v without SG 721/38, 744/45 with white gum – Cat. £24 – Rs.325. India – 1974 – SG 740/42 – Centenary of UPU – Cat. £1.40 – Rs.40. India – 1974 – SG 763/66 – Indian Birds – Cat. £7.50 – Rs.120. India – 1974/76 – Fifth Definitive Series – SG 732 / 721 & 723 / 730, 731, 733, 735, 736 / 810 / 811 – Set of 5 FDCs – Rs. 200. India – 1975 – SG 699/72 – 500th Birth anniversary of Michelangelo – Block of 4 with FD Cancellation – Cat. £3.25 – Rs.30. India – 1975 – SG 779 – 25p – Dances of India – Full sheet of 35 stamps – Rs.300. India – 1977 – Collection of stamps – SG 837/73 – 37v with white gum – Cat. £32 – Rs.800. India – 1978 – SG 874 to 907 – Complete collection of 26 FDCs, except FDC of Museums of India – Rs.270. India – 1978 – SG 885 – Hill Women (Amrita Sher Gil) – Block of 4 with FD Cancellation – Cat. £8 – Rs.25. India – 1978 – SG 890 – 25p – Treasures of Indian Museums – Full sheet of 35 stamps – Rs.300. India – 1979 – SG 953 – 500th Anni. Guru Amar Das (3rd Sikh Guru) – Set of 3 FDCs with special cancellations from Goindwal, Basarke Gillan & Amritsar (RARE) – Rs. 150. India – 1979 – Set of two Special Exhibition Covers of District Level Exhibition “AMPEX-79” by Amritsar Philatelic Club – GPO Building & Gurudwara San Sahib, Baserke Gillan depicts on cover – Rs.80. India – 1980 – Collection of commemorative stamps – SG 954/96 – 36v without SG 971, 982 & 991 – Cat. £27 – Rs.650. India – 1980 – Two covers with special pictorial cancellations “PINKPHIL-80 JAIPUR” – Rs.40. India – 1980 – First officially issued Booklet of India on India’80 – Rare – Rs.650. India – 1981 – Collection of stamps – SG 997/1033 – 37v with white gum – Cat. £34 – Rs.700. India – 1981 – SG 937 – 2p – Adult Education [Litho] – 2 full sheets 200 stamps – Rs.150. 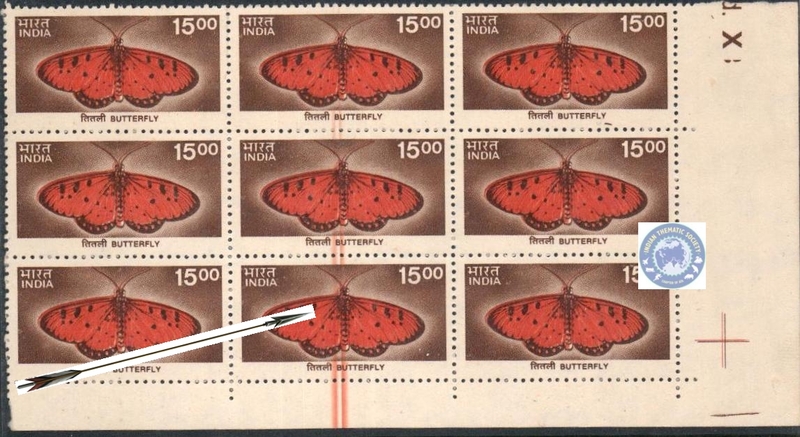 India – 1981 – SG 1019/22 – Indian Butterflies with white gum – Cat. £7 – Rs.80. India – 1982 – SG 1043/46 – Himalayan Flowers – Set of 4v, each with partial FD Cancellation – Cat. £7.50 – Rs.30. India – 1983 – Collection of commemorative stamps – SG 1072/1109 – 36v with white gum – Cat. £54 – Rs.850. India – 1985 – SG 1143 to 58, 64 to 71, 74 & 1175 – 28 FDCs; 9 with stamp of 50p, 12 with stamp of 100p, 6 with stamp of 200p & 1 with stamp of 300p – Rs.260. India – 1985 – SG 1172/73 – South Asian Regional Co-operation First Summit, Dhaka – FDC of 2v cancellation of Bombay – Rs.40. India – 1986 – Collection of stamps – SG 1181/91, 1195/97 – 14v only – Cat. £47 – Rs.325. India – 1988 – SG 1337 & 1338 – Jawahar Lal Nehru Birth Centenary – Two Full sheets of 15 stamps in each – Rs.1800. India – 1989 – Set of seven Post Cards issued on World Philatelic Exhibition in New Delhi – Rs.60. India – 1989 – SG 1386 – 60p – Pin Code – Corner strip of 15 stamps with T/L – Rs.200. India – 1991 – SG 1465/66 – Hindi writers; Mahadevi Verma & Jai Shankar Prasad – Se-tenant pair – Rs.3500. India – 1994 – SG 1603 – Endangered Water Birds (withdrawn issue) & SG 1599 Human resources on commercially used Registered cover dated 1.8.1995, having registration label but pen cancelled – Rs.800. India – 1995 – SG 1637/38 – India-South Africa Cooperation – Se-tenant corner block & MS1639 – Cat. £6.40 – Rs.300. India – 1997 – SG 1758/61 – Indepex’97; Post Office Heritage [6th issue] – Corner strip of 3 block of 4v with T/L – Rs.400. India – 1997 – Set of three postcards commercially used with three different cancellations of CENTIPEX-97, National Philatelic Exhibition from 28 to 30 March 1997 – Rs.50. India – 1999 – Set of 3 Special Covers of PUNPEX-99, State level exhibition by Punjab Circle – Rs.100. India – 2000 – SG 1904/05 – Millepex; National Stamp Exhibition, Bhubaneshwar – Endangered Species; Turtles – FDC of se-tenant pair – Rs.100. India – 2000 – SG 1930 – Butterfly; definitive stamp – Error; corner block of nine stamps, extra lines on central three stamps – Rs.1500. India – 2000 – SG 1934/37 – “INDEPEX-ASIANA-2000”, Migratory Birds – Partial sheet of four blocks of 4 stamps [4 sets] with margin on three sides & T/L – Rs.450. India – 2000 – VADOPEX-2000; set of two special exhibition covers – Blood Donation & Millennium Dawn – Rs.60. India – 2001 – SG 1979, 1980, 1984, 1985/86, 1993, 1994, 1996, 1998, 1999, 2000, 2001, 2002/05, 2006, 2007, 2014, 2019, 2020, 2021/22, 2023/25, 2026, 2027/34, 2035, 2039, 2040, 2047/48, 2049 & 2050/53 – 27 FDCs including some high value sets – Rs.500. India – 2001 – SG 2021/22 – Mahatma Gandhi; Man of the Millennium – Complete sheet of 20 se-tenant pairs – Rs.900. India – 2002 – SG 2108 – Dhirubhai Ambani – Sheet-let of 16 stamps – SL 27 – Rs.350. India – 2003 – SG 2154/56 – Jnanpith Award Winners [Malayalam] – Sheet-let of five se-tenants – SL 46 – Rs.4500. India – 2004 – SG 2235/36 – Greetings – Half Sheet of 14 se-tenant pairs with T/L – Rs.1200. India – 2004 – SG 2248 – Taj Mahal – Corner partial sheet of 10 stamps with margin on three sides – Rs.300. India – 2005 – SG 2266/69 – 75th Anniversary of Dandi March; Salt Movement by Mahatma Gandhi – Partial Sheet of four blocks of 4v [16 stamps] with T/L – Rs.300. India – 2005 – SG 2278 – Bicentenary of State Bank of India – Partial corner sheet of six stamps with T/L & margin on three sides – Rs.150. India – 2005 – SG 2283/86 – Letter Boxes – Complete sheet of five se-tenant sets – Rs.300. India – 2006 – SG 2309/12 – President Fleet Review, Visakhapatnam – Full Sheet of four blocks [two sets of each size] – Rs.650. India – 2006 – SG 2354/58 – Himalayan Lakes – Phila SL-63 – Sheet-let of four sets of 5 stamps – Rs.250. India – 2006 – SG MS2371 – Sandalwood Chandan M/Sheet – Cat. £1.25 – Rs.50. India – 2008 – SG 2488/89 – Aldabra Gaint Tortoise – Two different Sheet-lets of 13 mixed stamps each – Rs.500. India – 2008 – SG 2491/94 – Olympic Games; Beijing – Diamond shaped four designs – Complete sheet of nine blocks of 4v – Rs.650. India – 2008 – SG 2509/12 – Third Commonwealth Youth Games, Pune – Half sheet of five se-tenant pairs of 4v with T/L – Rs.300. India – 2008 – SG MS2556 – 10th Anniversary of BRAHMOS – 10 Miniature sheets – Rs.300. India – 2009 – Greetings – Complete Sheet-let of 9 blocks of four different stamps – Rs.425. India – 2009 – Heritage Jain Temples; Dilwara Temple & Ranakpur Temple – Two Sheet-lets of 8 se-tenant pairs in each – Rs.200. India – 2009 – Jayadeva and Geetagovinda – Two Miniature sheets of 11different stamps – Rs.140. India – 2011 – INDEPEX-2011; Gandhi – Khadi Stamp – Presentation Folder with Miniature Sheet – Rs.375. India – Commercially used 100 pre-stamped envelopes with Stationery Surcharged stamped – Good lot for study – Rs.350. India – Roses; Exhibition Cover of Chandipex-90 & Special cover of ROSE Festival at Chandigarh 25.2.1994 – Rose in cancellations of both covers – Rs.60. Indira Gandhi – Argentina, Bulgaria & 2 from USSR – Rs.50. Jawaharlal Nehru – Collection of 6v from Bulgaria, Czechoslovakia, German Demo. Rep., Hungary, Mongolia & USSR – Rs.60. Jawaharlal Nehru – Collection of 3 blocks of 4v from Bulgaria, Czechoslovakia & Hungary with one strip of 4v from Mongolia – Rs.150. Algeria – 1983 – Dogs – SG 855/56 – Cat.£1.95 – Rs.50. Armenia – 1992 – National Costume second issue – 2v – Rs.60. Armenia – 1999- EUROPA; National Reserves – Scott 589/90 – 2v – Rs.60. Australia – 1980 – Dogs – SG 729/33 – Cat.£2.25 – Rs.60. Australia – 2006 – Whales Down Under/WWF – Official set of 4 Maximum cards stamped and First Day Cancelled – Official sale price $7.10 – Rs.250. Austria – 2005 – Embroidery Stamp: Edelweiss Flower – Fv Euro 3.75 on FDC with pictorial Cancellation – Rs.400. Belgium – 1984 – Los Angeles Olympic Games – Souvenir Sheet – Scott 1166 – Rs.75. Belgium – 1988 – Olympic Games, Seoul – Miniature Sheet – B1074 – Rs.120. Berlin West – 1973 – Youth Welfare Stamps – Birds of Prey – SG B450/53 – Cat.4.90 – Rs.40. Berlin West – 1984 – Youth Welfare Stamps – Insects – SG B674/11 – Cat. £7 – Rs.60. Bermuda – 1996 – Lighthouses – SG 761/64 – Rs.150. Bhutan – 1997 – 50th Anniversary of Independence; INDEPEX-97 – Gandhi & Buddha – M/sheet of 4v of Nu 35 – Rs.100. Brazil – 1998 – International Year of Oceans; Expo’98 – Fishes/Sea Creatures – Beautiful Sheet-let of 24 stamps – Fv RS$7.44 – Rs.300. Burkina Faso – 1988 – Olympic Games, Seoul – Scott 841 – Rs.90. Chad – 1988 – Olympic Games, Seoul – Souvenir Sheet – C297 – Rs.120. Cyprus – 1999 – 25 Years of Injustice – Imperf M/Sheet of 3v – Specimen – Rs.150. DDR – 1966 – 3v – SG 925/27 – Red Cross / Blood Donation – Rs.60. Finland – 2003 – Lighthouses – Scott 1197a-e – Miniature sheet – Rs.160. France – 1969 – SG 1816 – FDC with Vouglans-Jura Barrage – Rs.60. Germany – 1969 – Mahatma Gandhi Centenary – FDC with pictorial Cancel showing portrait of Gandhiji – Rs.100. Germany Fed. Rep. – 1991 – Butterflies – SG 2361/68 – Cat. £.11.35 – Rs.150. Germany Fed. Rep. – 1993 - Youth Welfare Stamps – Insects – SG 2511/5 – Cat. £11 – Rs.80. Gibraltar – 2000 – EUROPA; Fountains, Hands, Airplane & Rainbow – Scott 837/40 – Rs.130. Great Britain – 1969 – Mahatma Gandhi Centenary – FDC with SG 807 – Rs.100. Great Britain – 1978.08.02 – Cycling – Commercially used FDC of complete set of 4v with first day cancellation – Rs.150. Isle of Man – 2001.17.5 – Joey Dunlop; King of The Mountain – Presentation pack of 6v – Fv of stamps £2.61 – Rs.220. Kenya – 1977 – WWF Endangered Species – M/Sheet with 4v – SG MS101 – Cat. £7 – Rs.100. Luxembourg – 1964 – Inauguration of Hydro-electric Pumping Station at Vianden – A nice FDC for theme Electricity, with 3v (SG 740/2) – Obliterated by pict. FD Cancel – Rs.80. Malaysia – 1997 – 50 Years of Organised Philately – M/sheet of 4 diagonal stamps with logo of MALPEX-97 – Rs.75. Mozambique – 1979 – Dogs – SG 785/90 – Cat. £ 2.85 – Rs.60. Myanmar – 2004 – World Buddhist Summit – Set of 2 stamps – Fv K35 – Rs.120. Nepal – 1995 – Birth Place of Gautam Buddha, Lumbini – Scott 580 – Fv R.20 – Rs.40. Nepal – 1996 – Scott 592 – Ashoka Pillar, Lumbini [Buddha] – Se-tenant pair of 2 same stamps – Rs.50. New Zealand – 1982 – Health Stamps; Dogs – M/sheet – SG MS1273 – Cat. £4.25 – Rs.70. New Zealand – 1983 – Health Stamps; Cats – M/sheet – SG MS1323 – Cat. £2.25 – Rs.40. Philippines – 1979 – SG 539/44 – 6v (3x Dog+3xCats) – Cat. £8 – Rs.80. Rhodesia – 1974 – Butterflies – SG 503/4 + 506/8 – 5v – Cat. £2.60 – Rs.60. Saint Lucia – 1994 – Bicentennial of The Abolition of Slavery – 1v & M/sheet of 1v – Fv $5.20 – Rs.100. Saint Lucia – 1996 – 15v – Flags and Ships – Fv $49 – Rs.1000. Samoa – 1988 – Olympic Games, Seoul – SG 787 – Rs.90. Solomon Islands – New National Parliament Building & High Court Building – M/sheet of 1v – Rs.75. Sri Lanka – Birds of Sri Lanka – Souvenir sheet of 4v – Rs.60. Switzerland – 2004 – Wooden Stamp First Day Cover – Rs.400. Tanzania – 1977 – WWF Endangered Species – M/Sheet with 4v – SG MS217 – Cat. £4.50 – Rs.100. Togo – 1989 – Barcelona Olympic Games – Souvenir Sheet – Rs.80. Uganda – 1977 – WWF Endangered Species – M/Sheet with 4v – SG MS204 – Cat.£4.50 – Rs.100. United Nations NY – 2009 – Mahatma Gandhi – Non-Violence Day – FDC, stamp & cancellation showing Mahatma Gandhi – Rs.180. Yemen Republic of – 1999 – The First General Conference of Yemeni Immigrants – 2v & M/sheet of 2v – Rs.180. Zimbabwe – 1993 – Minerals – Scott 676/81 – Rs.150. 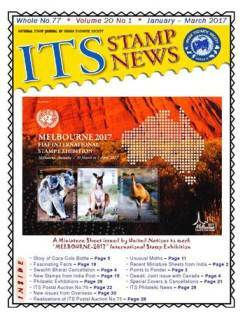 American Philatelist, Monthly Journal of American Philatelic Society – 9 issues – May 2007 to January 2008 – Priced US $4.95 each – Rs.450. Cycling – Ten different special cancellations all from overseas countries, some are very rare, no any First Day Cover – Rs.350. Diana; Princess of Wales – A nice collection of 27 stamps, 36 Miniature & Souvenir Sheets and two commercially used covers, mostly issued on death anniversary by different countries – Cat. > £350 – Rs.7000. Gibbons Stamp Monthly Magazine from UK – November 1992 & May 1993 – Two issues – Very fine condition – Rs.120. International Philatelic Auction Catalogue by Hobby Philatelie, Germany – 18 September 2001 in three diff. books with so many text pages & 196 colour plates – Rs.300. PARSI – Zoroastrians on Stamps, Edited by Noshir M. Lam. 144 pages with detailed illustrations, Priced Rs.350/-, hard bound, limited copies printed – RARE – Rs.400. The Guinness Book of Stamps, Facts & Feats by James Mackay second edition 1988 by Guinness Publishing Ltd., Great Britain, priced £11.95 – Xerox copy – 225 pages – RARE – Rs.600. The Philatelic Adventures of Sherlock Holmes – ATA Handbook # 139 – Cost price US $12 – Rs.500. Topical Time, Bi-monthly magazine of American Topical Association, USA – Vol. 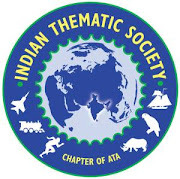 61 & 62, complete year 2010 & 2011 – Twelve issues – Rs.1000.